"Early humans needing to be especially alert in a dangerous environment divided the world into us and them, friend and foe. Sumerians changed that to civilized and savage, which Greeks modified to Greek and Barbarian. Romans created new tiers, dividing people by wealth and background and vastly increasing the pool of slaves. Christians claimed that all such divisions disappeared when compared to the difference between God and humanity. But then Crusaders slaughtered infidels and monstrous men. Evan as encounters with new peoples shook those religious certainties, a new division arose: race. Race seemed to divide people more firmly than ever before, since each person's capabilities were set by his or her parents, and grandparents, and remote ancestors. By the twentieth century race was no longer a personal matter. The health of nations depended on maintaining absolute purity" (pg. 206). "In writing this book, I have learned to pause. I have learned that images of others that seem absolutely true may not be. I have also learned that they cannot be wished away. Nothing is more human than to notice people who are different, and to think yourself superior or fear you are inferior. But right now, for the very first time in human history, we have learned to mistrust those feelings." This book made me even more aware of our need to "mistrust" some of the instant judgments we might make about a person or groups of people. For me the value in reading history is looking at what happened in the past from sort of an objective, bird's eye view, and then trying to look at current times in the same critical way, to see where changes can be made. I guess that's just a confusing way of saying, "Those who do not learn from history are doomed to repeat it." I have had this blog for about five months now, and I've never done so much reading in my life! I've always loved to read, but have always had time constraints: babies and toddlers, daycare, kids' sports with the occasional run as team mom, stressful and busy church responsibilities, a venture into the world of Girl Scouts as a leader, and all the other usual things moms choose to do. Most of the time, I would read a little bit of a book each day, and when there was a quiet week or two, I would go out on an all time reading BINGE, not knowing when there would be time again. So basically, each day I find I have about 3-4 hours of time each day that I can pretty much choose what I want to do! I don't know how long this will last, so in my mind I'm feasting even though there is no famine! Reading and talking about books brings me so much happiness, but I do have other areas of interest that are getting pushed aside, and I'm sure many things that I need to be doing. I don't think I've been ignoring my family (although maybe I should ask! ), and miraculously most areas of my house stay clean most of the time these days, but I know I could be doing more to be a part of that outside world that I'm always inside reading about! This sounds like some sort of farewell speech, but it's not. I'm not that disciplined. My plan is to get through the reading challenges I've currently signed up for (I may add one more--the non-fiction challenge I've read about), and finish the 100+ Challenge, and then I'm going to give myself a reading limit. Maybe I can only read an hour a day, or something like that. I'll cross that bridge when I come to it I guess. Can anyone relate to this? Have you felt like you need to set limits on your reading time, or can you enjoy it guilt-free? Reading is a very worthy pursuit, but how much is too much? Like many other avid readers, I often feel like there is not enough time to read all of the books I want to read, and I have to remind myself that my life can still be rich and meaningful even if I never get to Bleak House or Jonathan Strange and Mr. Norell. It's hard for me to accept, but I know it's true. Note: I severely overuse the exclamation point, don't I? This seems like the perfect book for a relaxing day at the beach (that is if your trips to the beach are the relaxing sort, which hasn't been the case for me for almost 15 years.) Or maybe the book you take on vacation when you want something lighthearted and fun. Or, if you are miserably confined to your bed for the day with a sore back, and you need something to cheer you up a bit. I have never had back trouble until this past weekend, and I was so glad to have Austenland available to take my mind off my misery. You're a really great guy, but I'm married, so I think we should just be friends. Pride and Prejudice-obsessed Jane Hayes has failed to find a boyfriend that lives up to the standard that Mr. Darcy has set. So when she is given an all-expense paid trip to Austenland, an English resort where Austen's world comes to life, she decides the trip will help her get all of her fantasies out of her system before finally giving up on men. As Jane gradually gets the hang of playing the part of a Regency lady, the difference between what is real and what is not blurs as she tries to make sense of what she really wants. The book is quick and witty, but not as good as the two others by her that I've read--Goose Girl and Princess Academy. But since they are completely different genres, it's not really a fair comparison. As far as Austenland goes, you get that cozy chick flick feeling from a book in not much more time than it takes to watch a movie. 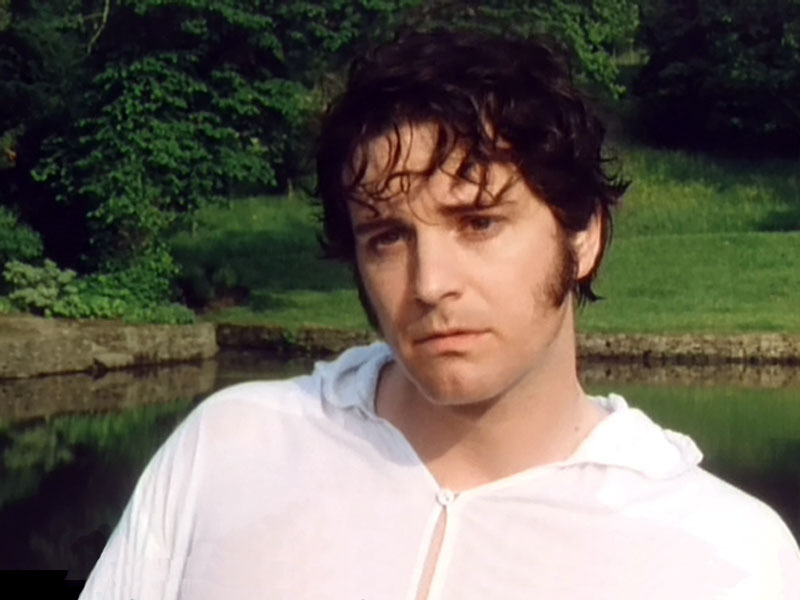 *Colin never looks quite as good in subsequent movies as he does in Pride and Prejudice--believe me, I've done my research! It seems the more I love a book, the less I want to write about it! I just want to say, "Read it! It's so good!" It doesn't help matters that I can't really pinpoint what it is that makes this novel so richly satisfying. Everything Smith writes is honest and moving, as she paints a picture of the life of an Irish-American family living in poverty in Brooklyn in the 1910's. And that's really all I'm going to write. Oh, and I should say that this was a book club selection, and everyone who read it loved it also. 1. The last time I lost my temper I did lots of deep breathing and put myself in time out! 2. Unflushed toilets is what I'm fed up with! 3. The next book I'd like to read is Love in the Time of Cholera. 4. Seeing Prince Caspian at the El Capitan Theatre in May is what I'm looking forward to. 5. If you can't get rid of the skeleton[s] in your closet, listen to some Oingo Boingo! 6. The best thing I got in the mail recently was Netflix movies. 7. (This is all in the past now, but. . .) And as for the weekend, tonight I'm looking forward to a campout with the Young Women, tomorrow my plans include book club and casserole exchange and Sunday, I want to rest(with a messed up back)! In 1994, between April and July, as many as a million Tutsis of Rwanda were systematically murdered by rival extremist groups, and Immaculee Ilibagiza was forced to hide out in a tiny bathroom with nine other women for three months in order to avoid capture and death. What was going on in my life at the time? I was awaiting the birth of my first baby, and wrapped up in my own secure world. My biggest worry was finding a new apartment--our current one was about 400 square feet with no room for a crib. Looking at the photos in the book, it looks like the bathroom Imaculee hid out in was about 24 square feet . . .
As the title indicates, this is foremost a story of faith. Immaculee, a devout Catholic, maintained her sanity and her will to live by relying on her faith in Jesus Christ. At times she struggled with anger, hate, fear, and hopelessness ("If I'd had an atomic bomb, I would have dropped it on Rwanda and killed everyone in our stupid, hateful land" pg. 88), but each time she prayed and rededicated her faith. She also let herself think of the future, although it seemed unlikely she would have one, and even taught herself English while in the bathroom. For me there were other powerful themes as well. What struck me the most was the dangerous power of propaganda. The Interahamwe (the extremist Hutu group seeking to exterminate the Tutsis), would broadcast hateful, twisted messages about the "cockroach" Tutsis (I can just hear my high school teacher Mr. Diamond's lesson about "dehumanizing the enemy.") These words literally incited mobs of people to cut down hundreds of their previous friends and neighbors with machetes. How much do we let the media that we are surrounded by influence us? At first I think we can resist, but how long after hearing something over and over again do we begin to change our mindset, no matter how absurd or dangerous it may be? I also wondered what about their society allowed this to happen? Is it just human nature and could it happen anywhere? Was it their value for obedience? Their cultural suppression of emotions? What can be done to prevent genocide from occurring repeatedly, even though we say we will "never let it happen again?" In this case, one factor was the seeds of contention that Belgium purposefully planted when they left the area. A powerful few who seem to regard entire populations of people as puppets to manipulate. Overall, books like this always engender an overwhelming feeling of gratitude. Gratitude for peace and comfort. Gratitude for family. Gratitude even for the simple space around me. Immaculee was able to find forgiveness for all those who murdered her family and friends. She says, "They saw but didn't understand the terrible harm they'd inflicted. . .Their minds had been infected with the evil that had spread across the country, but their souls weren't evil" (pg. 94). I think I could find it in me to forgive them, but not the leaders who knew the lies they were telling for the purpose of bringing about the genocide. I guess I have a long way to go to achieving perfect faith and humility, and hopefully I won't have to experience as much tragedy as Immaculee to get there. This poetic memoir of pilot Beryl Markham is more a gathering of meaningful memories than a story of her remarkable life. Born in 1902, she moved with her father from England to East Africa as a young child. She learned to train and breed horses, learned how to fly a plane, and at the age of 34 became the first person to fly solo across the Atlantic Ocean from east to west. I love Africa (as an armchair traveler only, sadly)--stories of Africa, pictures of Africa, movies of Africa (such as Out of Africa) . . . You get the idea. Her descriptions of the land and the people were so vibrant and I loved the words she chose to paint a picture of her memories. I was very much carried away with her beautiful descriptions, and then . . . There are all kinds of silences and each of them means a different thing. There is the silence that comes with morning in a forest, and this is different from the silence of a sleeping city. There is silence after a rainstorm, and before a rainstorm, and these are not the same. There is the silence of emptiness, the silence of fear, the silence of doubt. There is a certain silence that can emanate from a lifeless object as from a chair lately used, or from a piano with old dust upon its keys, or from anything that has answered to the need of a man, for pleasure or for work. This kind of silence can speak. Its voice may be melancholy, but it is not always so; for the chair may have been left by a laughing child or the last notes of the piano may have been raucous and gay. Whatever the mood or the circumstance, the essence of its quality may linger in the silence that follows. It is a soundless echo. So if you like this style, you will love this book, but if you're gagging as you read it, just pass this one by. I still would have to say that I enjoyed it, regardless of who really wrote it, but I do feel a bit cheated that some of the stories were not entirely true. I sort of had a love-hate relationship with this book. 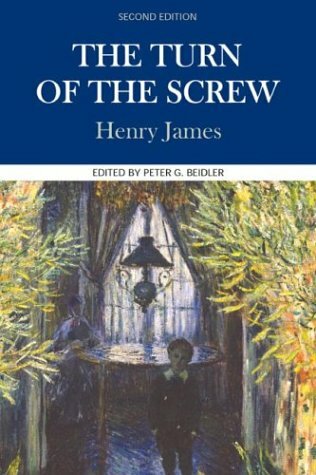 It is my first Henry James work, and it was not at all what I expected it to be. The story is basically about a young woman who accepts a position as governess for two small children, Miles and Flora. Having lost their parents, their uncle is responsible for them, but keeps his distance, and has asked the governess (I can't even recall her name and can't find it skimming through the book--I think she is only addressed as "Miss.") to never bother him with any troubles or questions. "Miss ?" settles in happily at first, daydreaming of pleasing the Uncle who is a handsome bachelor, but soon begins to see a couple of ghosts. At first, the story was a bit annoying--the governess has an inflated sense of herself and her role, unrealistically idealizes the two children, and is obsessed with pleasing the uncle who she only met for a short time. But then I began to think that this was the author's design--I began to wonder if there really were ghosts, or if the governess is mentally ill, and is just hallucinating. Most of the story is told by the governess, and she always seems a just a bit removed from sanity. There were parts that I couldn't follow, and I couldn't decide if that was because she was mentally ill, or if it was because I was mentally unable! Just finishing this I am left with so many questions. Were there really ghosts, or are they a figment of her imagination? Was James trying to say something about appearances and their exaggerated importance in Victorian society? At times I wondered if the ghosts represented the evil within that the children would eventually have to succumb to as they grew up. At one point it seemed to me like the reader was to infer that the children had been molested, and that the boy, who had been sent home from school for an unknown offense, had committed some deviant act. Or maybe, since this was in Victorian times, they were just minor offenses that were considered very inappropriate at the time. The bottom line is, "I don't know!" This was the selection for my wonderful library's classics book club, and was one I had chosen for a reading challenge. I can't actually go to the discussion, which starts in about 15 minutes, but I would have loved to find out some other thoughts on all of these questions from the other readers. For now, I will just question and wonder (or pay a visit to Wikipedia!). Sometimes I think that that is what makes some classics last--unanswered questions that can be debated for decades! 2. Roxette makes me wanna dance! 3. Splitting a few appetizers between friends is no good, I want them all to myself! 4. My 13-year-old daughter is someone I'd like to get to know better. 5. The smell of orange blossoms reminds me so much of springtime! 7. And as for the weekend, tonight I'm looking forward to my husband coming home from Wisconsin, tomorrow my plans include scrapbooking with friends and Sunday, I want to spend time with family!